The weather last Sunday was beautiful, 85 degrees here in sunny SoCal. We had some friends over for an asado (Argentine style BBQ). I made my lemon cake for dessert, so easy and refreshing. It never fails to be a big hit! Try it. Prepare and bake cake according to package directions using a 13"x9" pan. While cake is baking, squeeze lemon juice into a small bowl. Add powdered sugar to juice, stirring to dissolve sugar. Keep adding sugar until mixture reaches the consistency of pancake batter. The amount of sugar will vary depending on how much juice your lemon produced. When cake is done, remove from oven and poke holes all over the top using a toothpick or slender fork. Pour glaze over top of cake. Spread gently, allowing glaze to soak into cake. Cool. Finished cake will be glazed, moist and deliciously lemony. 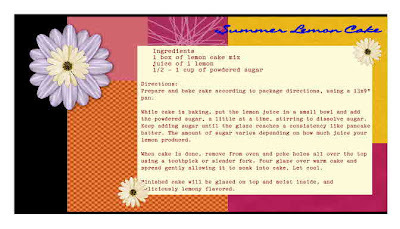 I have never had your lemon cake recipe but now that I do I'm definitely going to make it! Thanks! Oh that sounds so yummy! I'm going to have to make this! Lemon cake made with a dash of love tastes best.